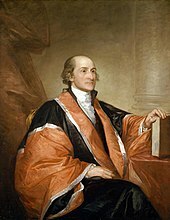 The Jay Court refers to the Supreme Court of the United States from 1789 to 1795, when John Jay served as the first Chief Justice of the United States. Jay served as Chief Justice until his resignation, at which point John Rutledge took office as a recess appointment. The Supreme Court was established in Article III of the United States Constitution, but the workings of the federal court system were largely laid out by the Judiciary Act of 1789, which established a six-member Supreme Court, composed of one Chief Justice and five Associate Justices. As the first President, George Washington was responsible for appointing the entire Supreme Court. The act also created thirteen judicial districts, along with district courts and circuit courts for each district. The Court held its inaugural session on February 2, 1790, at the Royal Exchange in New York City. However, with no cases on the docket and little pressing business, the term lasted for only eight days. It was not until August 1791 that the Court issued its first decision. That same year, the Court moved with the rest of the federal government to Philadelphia. The Court's business through its first three years primarily involved the establishment of rules and procedure; reading of commissions and admission of attorneys to the bar; and the Justices' duties in riding circuit, to preside over cases in the circuit courts of the various federal judicial districts. It heard only four cases during Jay's chief justiceship. During his tenure, Jay established an early precedent for the Court's independence in 1790, when Treasury Secretary Alexander Hamilton wrote to him requesting an advisory opinion on proposed legislation supported by the president. Jay replied that the Court's business was restricted to ruling on the constitutionality of cases being tried before it and refused to allow it to take a position either for or against the legislation. This established a precedent that the Court only hears cases and controversies. In September 1789, Washington nominated John Jay as the first Chief Justice and nominated John Rutledge, William Cushing, James Wilson, John Blair Jr., and Robert Harrison as Associate Justices. All were quickly confirmed by the Senate, with Wilson being the first to take the prescribed oaths of office—on October 5, 1789—and to be fully vested as a member of the Supreme Court. Then, after Harrison declined the appointment, Washington appointed James Iredell in 1790. Rutledge resigned in 1791 and was replaced by Thomas Johnson, who resigned in 1793. Johnson was replaced by William Paterson. The justices represented every region of the country, as Washington emphasized geographical balance in making his appointments. The Jay Court ended in 1795, when Jay resigned to become Governor of New York. Jay was replaced via recess appointment by John Rutledge, though Rutledge was denied confirmation by the Senate. Oliver Ellsworth became the third Chief Justice in 1796. Note: The red vertical line denotes September 24, 1789, the date on which the U.S. federal judiciary was established by Congress. The green vertical line denotes February 2, 1790, the date on which the U.S. Supreme Court convened for the first time. The Jay Court did not issue many major rulings, but Chisholm v. Georgia (1793) stands as the first important ruling of the Supreme Court. The court held that the state of Georgia could be sued in federal court, establishing an important precedent that the states of the union do not constitute fully sovereign states. However, the Eleventh Amendent, ratified in 1795, granted states sovereign immunity from suits in federal court by citizens of another state. ^ Hodak, George (February 1, 2011). "February 2, 1790: Supreme Court Holds Inaugural Session". abajournal.com. Chicago, Illinois: American Bar Association. Retrieved August 24, 2017. ^ Schwartz, Bernard (1993). A History of the Supreme Court. New York: Oxford University Press. pp. 15–16. ^ "Supreme Court Oath Firsts and Other Trivia". www.supremecourt.gov. Retrieved January 11, 2018. Abraham, Henry Julian (2008). Justices, Presidents, and Senators: A History of the U.S. Supreme Court Appointments from Washington to Bush II. Rowman & Littlefield. ISBN 9780742558953. Casto, William R. (2012). The Supreme Court in the Early Republic: The Chief Justiceships of John Jay and Oliver Ellsworth. University of South Carolina Press. ISBN 9781611171693. Friedman, Leon; Israel, Fred L., eds. (1995). The Justices of the United States Supreme Court: Their Lives and Major Opinions. Chelsea House Publishers. ISBN 0-7910-1377-4. Gerber, Scott Douglas, ed. (1998). Seriatim: The Supreme Court Before John Marshall. NYU Press. ISBN 9780814732519. Hall, Kermit L.; Ely, Jr., James W.; Grossman, Joel B., eds. (2005). The Oxford Companion to the Supreme Court of the United States (2nd ed.). Oxford University Press. ISBN 9780195176612. Hall, Kermit L.; Ely, Jr., James W., eds. (2009). The Oxford Guide to United States Supreme Court Decisions (2nd ed.). Oxford University Press. ISBN 978-0195379396. Hall, Timothy L. (2001). Supreme Court Justices: A Biographical Dictionary. Infobase Publishing. ISBN 9781438108179. Harrington, Matthew P. (2008). Jay and Ellsworth, the First Courts: Justices, Rulings and Legacy. ABC-CLIO. ISBN 9781576078419. Hoffer, Peter Charles; Hoffer, WilliamJames Hull; Hull, N. E. H. (2018). The Supreme Court: An Essential History (2nd ed.). University Press of Kansas. ISBN 978-0-7006-2681-6. Irons, Peter (2006). A People's History of the Supreme Court: The Men and Women Whose Cases and Decisions Have Shaped Our Constitution (Revised ed.). Penguin. ISBN 9781101503133. Johnson, Herbert A. (2000). "John Jay and the Supreme Court". New York History. 81 (1): 59–90. JSTOR 23181808. Martin, Fenton S.; Goehlert, Robert U. (1990). The U.S. Supreme Court: A Bibliography. Congressional Quarterly Books. ISBN 0-87187-554-3. Stahr, Walter (2012). John Jay: Founding Father. Diversion Publishing Corp. ISBN 9781938120510. Tomlins, Christopher, ed. (2005). The United States Supreme Court: The Pursuit of Justice. Houghton Mifflin Harcourt. ISBN 978-0618329694. Urofsky, Melvin I. (1994). The Supreme Court Justices: A Biographical Dictionary. Garland Publishing. ISBN 0-8153-1176-1. Wood, Gordon S. (2009). Empire of Liberty: A History of the Early Republic, 1789-1815. Oxford History of the United States. Oxford University Press. ISBN 978-0-19-503914-6. This page was last edited on 25 January 2019, at 18:38 (UTC).